Just released v1.2.1 with a design facelift and the new App Status page. If you have no network signal, then the Data Connection will display Offline. If the GPS accuracy is bad (worst than the one you have configured in settings) then it will be displayed using red. 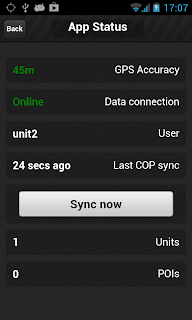 So if you don't see any red text then you are OK.
With the 'Sync now' button you can force the COP synchronization which means that the app will upload your current position and download the positions and messages from other units. 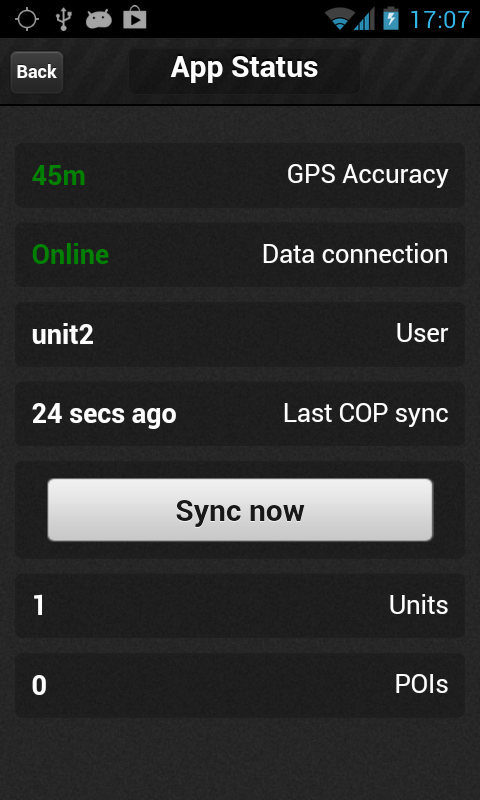 This COP synchronization happens automatically in every 30secs - 15mins according to what you have configured, but one way to conserve the battery is to set the position upload interval to a high value and report the position manually using the 'Sync now' button. Note I: This update is available for the paid versions on both iOS and Android. The Lite versions will be updated shortly. Note II: This version fixes the bug of 1.2.0 (released yesterday) on iOS which caused app to crash at startup on some devices.